The FT 7900R by Yaesu is one of the finest as far as amateur ham radios are concerned. This is not a brand new radio, but it is the best seller in the market. This product has simplicity in mind with the operation as well as high-performance sharpness. We love Yaesu products, and we will demonstrate why in this review. 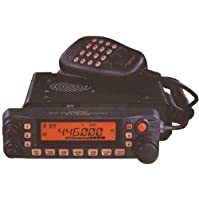 The FT-7900R is the kind of the go-to when you are looking for a new radio getting into the hobby or if you want a solid dual band radio in your vehicle or at home. This product is not that confusing compared to some of the China models that are on the market or other manufacturers. Large Omni Glow Alphanumeric LCD. 5 One Touch Hyper Memories. The first thing you are going to notice during unboxing is your warranty card, which is a limited warranty that is valid in the US and Canada. There is a detailed operating manual, which contains well-defined guidelines on how to use the radio. The compact box comes with the MH 48 microphone, power cord, microphone holder, spare fuses, mounting bracket, mounting screws, and of course the FT-7900R radio. This is a compact model that measures 5.5 by 1.6 by 6.6 inches and weighs approximately 2.2 pounds. You will notice that the bottom of the radio acts as a heat sink, but it also has a fan. The AC data jack is on the back for different operations, such as BPS packet. You also have your external speaker. The mounting screws are on the sides for the mounting bracket. Your microphone connects to the side, indicated by the word “MIC”. This model comes with a remote head kit, which will not only allow you to separate the face but also allow you to put the radio under your seat and the head kit on your dashboard. One of the most notable features of this model is the large LCD screen that is integrated with backlight for easy reading, especially when driving at night. You get maximum output with this model, including 40 watts on 430 megahertz, and 50 watts on 144 megahertz. It has 3 lower power levels, which ensure you do not use excess power. The power level is stowed in hyper as well as regular memory registers. The receiver has a wide coverage that extends from 700 to 999.99 and 108 to 520 megahertz. This coverage allows you to explore amateur, business, government, public safety, AM aircraft communications. This model has an impressive memory channel capacity, consisting of registers for 1000+ channels. Each register can store an alpha-numeric label of six characters. The memories may be accommodated in any of the available twenty memory groups. If you so desire, you can have a specific memory channel in multiple groups. This radio allows you to instantly recall the NOAA weather frequencies (10). You can also have the Severe Weather Alert function enabled in order to sound the alarm when there is a broadcast of a severe weather alert. The radio’s DTMF signaling ability includes internet linking nodes for easy internet connectivity. The menu structure of the FT-7900R is fairly easy to navigate. Holding the band set button on a long press gives you the menu. Using the VFO knob or the up and down arrows on the top of the remote mic, you can go through all the menu options. The VFO knob allows you to navigate different functions, including automatic power off, automatic repeater shift, dimmer, CWID (which is in part with the ARTS). ARTS or the automatic range transponder system is a Yaesu specific function, which lets you know if there is another ARTS enabled radio in simplex communication range. Turning the VFO knob will navigate you through all the functions that come with the FT-7900R. Simplicity and versatility are what you get with the Yaesu FT-7900R. It is an easily serviceable amateur ham radio. You will find the RX audio is remarkably loud when you feed it into an external speaker. This model achieves the full 50 watts on 144 megahertz. What we find most impressive is simple and safe to operate front panel, which is ideal for amateurs who don’t need cross-band repeat. The FT-7900R provides 50 Watts of power on the 144 MHz band, and 40 Watts on the 430 MHz, and is designed for simplicity of operation along with high performance in the receiver section. The lead photo of the Yaesu FT 7900R in this review is the wrong radio. It’s of the ICOM IC-M802.